“You are with us or against us” and many other slogans President Bush used after 9/11 to force an alliance. In the forthcoming local elections, The Sri Lanka Muslim Congress (SLMC) position is better described as ‘with you and also against you.’ The SLMC joined the United People’s Freedom Alliance (UPFA) to get the 18th Amendment through Parliament, for which the party was rewarded, although the SLMC had backed Sarath Fonseka in the last Presidential Elections and the United National Party (UNP) in the parliamentary elections. The SLMC has no rational explanation as to how and who decides flickering party positions, and it continues to assume people can be fooled all the time. During the last parliamentary elections the SLMC vehemently ridiculed the Mahinda Chinthana, and the Rajapaksa-regime was considered most Muslim-unfriendly. Ironically, the SLMC is now governed by Mahinda Chinthana but, given Parliament majority, the UPFA does not need the SLMC for implementing the Chinthana. The SLMC no longer can extract special favours, and even with other Muslim MPs in the UPFA, in reality, no one has critical bargaining powers with the government to benefit the community. In the upcoming Provincial Elections, the SLMC has allied with the UPFA in the North-Central and Sabaragamuwa Provinces, and contests independently in the Muslim majority Eastern Province. The UPFA didn’t opt for Bush-choice: you’re either with us or against us, but is going along with the SLMC in the East because the SLMC cannot be independent of the UPFA as long as it is in the central government alliance. With the end of LTTE terrorism, the threat to the Muslim voice is removed. Although being victims of discrimination, Muslims have not been consistent in articulating grievances. After M.H.M.Ashraff, the SLMC demonstrated structural disarray and functional inability to provide a policy glue to hold together candidates chosen by the people to the Parliament. Under Rauff Hakeem, the party shifted between UPFA and UNF Governments, and most SLMC members, on entering Parliament, have preferred to join the government for power and perks. As a result the SLMC, a party formed to unify the Muslim voice and redress grievances, in reality, has become disgruntled splinter groups thorough internal rift and conflict, and a laughing stock of other communities. Sri-Lanka is a multi-religious, multi-ethnic and poly-lingual country and all citizens should have equal rights and opportunities to pursue life-goals without fear of intimidation. So far these ideals have not been faithfully upheld. The formation of the SLMC in the ‘80’s, with ethnic overtones further polarized Muslims from the main stream, and with it, search for consensus building across other communities on common issues also closed. Today, the SLMC has neither interest nor the capacity to mobilize expertise to debate/support national development strategies and use sensitive pressure points for collective bargaining, which the government is obliged to respond. The late Ashraff realized the danger of advocating a communal slant on every issue, and therefore, found reason to form the National Unity Alliance (NUA) for accessing the main stream. Today, Rauff Hakeem in his own wisdom finds it useful to resurrect Ashraff only in election posters. Sri-Lanka paid a heavy price to overpower terrorism but, peace cannot be won if the level of estrangement and enmity between different communities in this country are allowed to prosper under the thrust of communally motivated slogans. 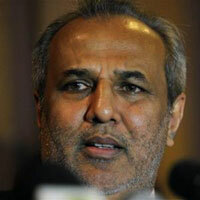 It is in this light Rauff Hakeem and his party will have to review the future. Muslims are citizens of this country, and therefore if they are denied any of the constitutionally awarded civic rights, which other communities enjoy, every civic conscious person (from all communities) will have to be mobilized to give voice to this constitutional violation and discriminatory dispensations of rights. It will not always be helpful for the SLMC to be testing its strength against other parties. The SLMC may have calculated going alone as the only way to regain lost grounds (Chief Minister (CM) for instance) in the Eastern Province. Given essentially a tri-party (TNA, SLMC, UPFA) competition and the likelihood of no clear winner, it is unclear how much of the lost grounds the SLMC can regain. In the un-likely scenario of the Tamil National Alliance (TNA) going into coalition with the UPFA, there is a possibility of the SLMC being sidelined in spite of its securing more seats by a party. What if the SLMC is thrust with a TNA or UPFA coalition, without the SLMC claim for CM or a CM being externally imposed as a compromise candidate? Thus, in spite of the President’s blessings for going alone the SLMC may have plunged into deep waters. Once again the SLMC has reassured everyone it is not a serious partner for exploring common strategies for nation building. Instead, it will always be guided by parameters of party interest. Protecting the tree symbol seems more important to the SLMC than any other considerations. Given the flickering policy stance the SLMC adopts and decamping of members to other camps, once elected under the SLMC ticket, the ‘ Sacred Tree’ may not withstand political storms anticipated in the future.